Sealed in case with manual. FITNESS BOXING. NINTENDO SWITCH. FACTORY SEALED. U.S. RELEASE. 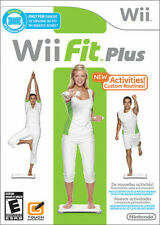 Wii fitness bundle! Also works for the Nintendo Wii U system. Tested and works great. If you have any questions please ask! - We offer FAST SHIPPING - shipments go out everyday except for Sundays and Holliday’s. - We offer FREE SHIPPING. Games will be shipped securely in a bubble mailer. - We offer BUNDLING DISCOUNTS - Look at our other items and contact us if you would like to bundle games together for a discount. - We offer RETURNS. We will pay for the returned shipping and give a full refund if your item is damaged or not functioning and give the refund when we receive the returned item. We want you to be confident in your purchase! Blessings! This is for Zumba Fitness 2 for the Nintendo Wii. EA Sports Active 2 Personal Trainer (Nintendo Wii) w/Heart Rate Monitor -Opened. Condition is Used but everything works fine. Shipped with USPS Priority Mail. The item is Brand New! box is open. Still in original factory shrink wrap! All items packed in bubble mailers and do not include an invoice or receipt in package. All photographs are stock photographs and may differ slightly from actual items sold. We are Goodwill North Central Wisconsin. Ships from our location within 1-2 business days (business days Monday - Friday) from USA. All items guaranteed. Very good condition game, check out photos! Obviously, as pictured, there is no balance board included. Game is complete with case and manual. Game will have very minor scratches and scuffs as typical with light use. EA Sports Active 2 Personal Trainer for PS3, Includes everything! EA Sports Active 2 Personal Trainer System. However the Heart Rate Monitor was not illuminating. USB Receiver. 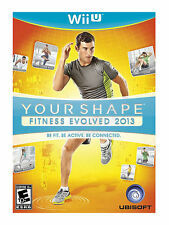 4.5 out of 5 stars - EA Sports Active 2 Personal Trainer for PS3, Includes everything! 46 product ratings46 product ratings - EA Sports Active 2 Personal Trainer for PS3, Includes everything! Trending at $3.58eBay determines this price through a machine learned model of the product's sale prices within the last 90 days. 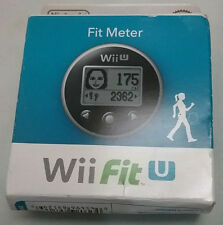 Wii Fit Plus Board With Game. Condition is Very Good. Shipped with USPS First Class Package. This is for Nickelodeon Fit for the Nintendo Wii. The disc has several light scratches and plays perfectly. The balance board is not included. 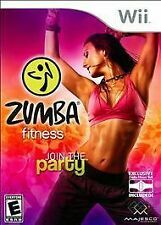 Zumba Fitness (Sony PlayStation 3, PS3) FITNESS BELT INCLUDED!!!! 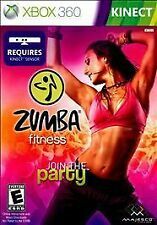 4.5 out of 5 stars - Zumba Fitness (Sony PlayStation 3, PS3) FITNESS BELT INCLUDED!!!! 62 product ratings62 product ratings - Zumba Fitness (Sony PlayStation 3, PS3) FITNESS BELT INCLUDED!!!! Trending at $15.32eBay determines this price through a machine learned model of the product's sale prices within the last 90 days. NEW OPEN BOX - Wii - EA Sports Active Personal Trainer - Leg Strap, Band & Game! PlayStation Move Required. See all Pictures. Nintendo Wii - The Biggest Loser and The Biggest Loser Challenge + Cookbook! Get in shape the fun way with The Biggest Loser and The Biggest Loser Challenge for the Nintendo Wii console Biggest Loser cookbook. Cookbook is in great shape. Want it a lot faster?. 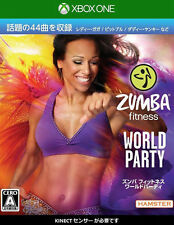 Zumba Fitness World Party. 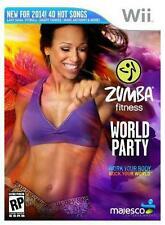 1 x Zumba Fitness World Party for XBOX ONE in original sealed box. for XBOX ONE. US/Canada Region. Our sales manager will leave you positive feed back once you have left positive feed back for us. 4.5 out of 5 stars - Zumba Fitness World Party for XBOX ONE X1 System Brand New Factory Sealed ! 40 product ratings40 product ratings - Zumba Fitness World Party for XBOX ONE X1 System Brand New Factory Sealed ! 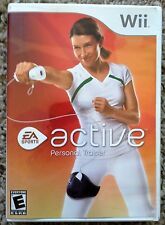 EA SPORTS Active: More Workouts (Game Only) - Nintendo Wii FAST SHIPPING!! VERY GOOD PREOWNED CONDITION The disc is in very good condition. There are minimal scratches, disc works well. The case is in excellent condition, and the instruction book is included. 4.5 out of 5 stars - EA SPORTS Active: More Workouts (Game Only) - Nintendo Wii FAST SHIPPING!! 2 product ratings2 product ratings - EA SPORTS Active: More Workouts (Game Only) - Nintendo Wii FAST SHIPPING!! The choreographies by Carlo Romano and Vera Sokolova from the prestigious "Carolyn Smith Dance Academy" will make you dance even though you have never done it before! Format: Sony PlayStation 4. Tab 6 Content.